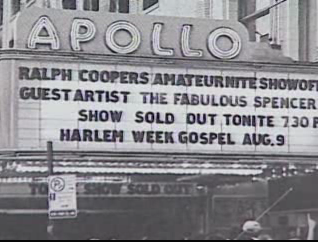 A clip from an interview with Ralph Cooper about amateur night at the Apollo and what it has done to dispel racism (1991). The American Black Journal, originally entitled Colored Peoples’ Time, was a regular television show aired on Detroit Public Television beginning in 1968. The show acted as a public forum, giving black citizens of Detroit a voice during a period of massive racial and civic turmoil. Each week, the show interviewed one or more community stakeholders in the Detroit area in order to deliver “history, news, and current affairs from a black perspective.” The American Black Journal was highly respected, both by those in positions of influence and everyday Detroit citizens. The interviews conducted as part of ABJ are reflective of this; the ABJ website is a digital archive of interviews with Motown legends, politicians, professional athletes, authors, scholars, musicians, and cultural icons— as well as interviews with high school students, religious leaders, teachers, and parents. Taken together these interviews represent over forty years of black history in Detroit, making their value as an educational, scholarly, and cultural resource invaluable. The ABJ website assists educators in leveraging these materials for use in the classroom by helping arrange various materials around learning themes and providing sample comprehension questions that can be utilized in classroom settings. The site also contains various search mechanisms, allowing users to have multiple access points to ABJ materials. By converting the original analog interviews to digital formats and disseminating those digital copies— and their contextualizing metadata —online for free, MATRIX is preserving and making accessible a significant cultural resource. We hope that you take advantage of this resource. If you have any further questions about ABJ or how you can use the materials for your own educational or scholarly needs, feel free to contact us.